Provide comfort for the family of Anne Buck with a meaningful gesture of sympathy. 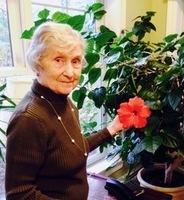 ORONO - Anna Buck, 12-year resident of Dirigo Pines in Orono, passed away peacefully following a brief illness on January 29, 2019, surrounded by family. Anna was born in the Ukraine. While still young, she immigrated with her family to Montreal, Canada. Skiing in the Laurentian Mountains brought her and her late husband, George, together. Her married life was spent in Orland, ME. Anna led a very active life. She and George continued skiing until late into their lives. They also enjoyed hiking, which led to their early involvement with Friends of Acadia, clearing and maintaining hiking trails. They were among founding members of and very active in the Downeast Outing Club. Another organization they supported was the Great Pond Mountain Conservation Trust. Anna and George were heavily involved with the Bangor Symphony Orchestra and Community Concert Series. They were instrumental in the creation of a Bucksport Chapter of American Field Service, and welcomed a Chilean student into their family in 1966. Interest in foreign student organizations continued for many years, during which time they hosted numerous young people. They travelled extensively and were able to visit some of their guests abroad. Anna is survived by daughters, Christie of Huntsville, AL, Alison of Easthampton, MA and son, Jonathan of Austin, TX. We encourage you to share your most beloved memories of Anne Buck here, so that the family and other loved ones can always see it. You can upload cherished photographs, or share your favorite stories, and can even comment on those shared by others. Provide comfort for the family of Anne Buck by sending flowers. Dear family of Ms Anne , may you find comfort in knowing that God has your love one in His Loving Memory . Acts 24:15 tells that God will not forget her. Revelation 21:4. Hope for our future . Soon no more tears of sorrow . To the Buck family I will try again to convey my sympathy to your family! I am Julie McGlauflin Levasseur who along with my parents Don and Ellie and my brothers Donny and Scott skied with you at Ski Horse Mountain many years ago! Remember? Remember?! I also enjoyed and continue to enjoy Bangor Symphony concerts as your mother and George did. She was larger than life for one who was so tiny! Take care. than life for one so little!